One of the hardest-to-predict days for Zack is by far Halloween. Z-Man has some pretty significant sensory issues -- they can range from itchy tags on a shirt to startling noise and even things like flickering lights and a need to jump, bump, and get some antsy feelings out of his limbs. So, you put the guy in a costume, ask him to walk a long distance with masks, strange sounds and a higher-than-usual level of sugar, and you could be asking for a disaster. But Zack did AMAZINGLY! He hung in there with scary ghosts, walked in a parade with other local kiddos, never took off his Popeye hat or bandana and managed to gracefully maneuver sidewalks and steps and utter frequent "Thank you" and "Happy Halloween" mutterings. 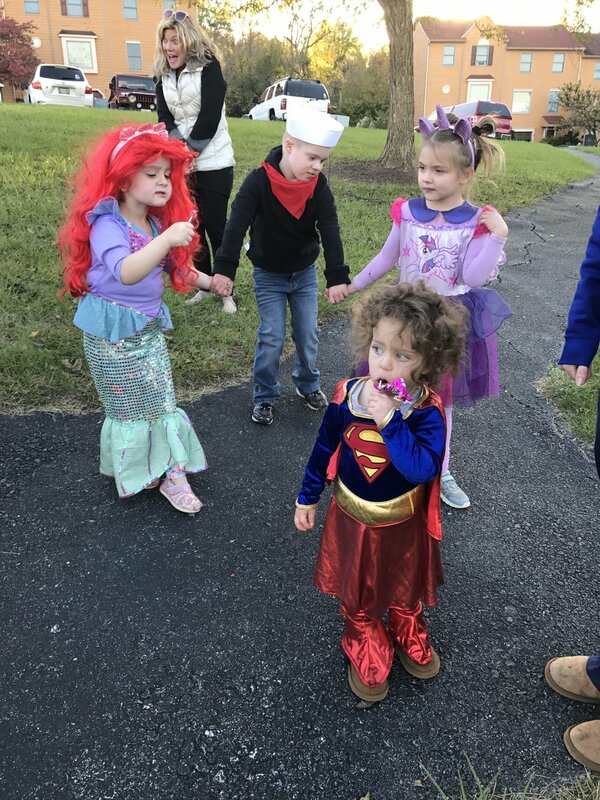 Just a couple of hours before we left for our Trick-or-Treat adventures, I saw a post on our neighborhood Facebook page reminding homeowners to be patient, kind and open-minded with some of the little costumed children possibly dealing with visible and invisible special needs and diagnoses. It was SO refreshing to see that on a day when my own anxiety is at an already-high level worrying about how the night will go. We collected candy, gave some pets to about every neighborhood dog, giggled and laughed dozens of times and -- perhaps my favorite part -- I received the sweetest hand squeeze with an "I love you much, Momma" as we trekked up one road together. He never darted across the street, never took a tumble and was so happy that I almost felt embarrassed and so, so silly for all the worries earlier in the day. Halloween was a success.